This figurine is one of the prettiest sports figurines we have ever handled. It is super colorful. It stands about 10.5" tall and is near mint. 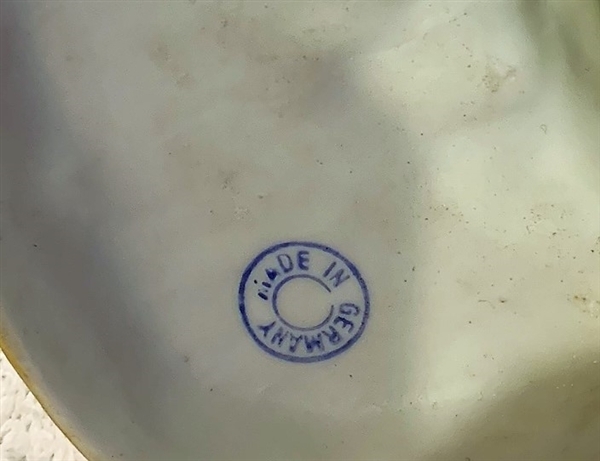 It is stamped "Made in Germany" under the base. There are markings on the back of the base. We believe that this piece was made by Heubach* as part of their sports series. Heubach figurines are porcelain figurines manufactured by the company Gebruder Heubach, based in Lichte, Germany from 1843 until 1925.